Food Packets on their way to needy families. 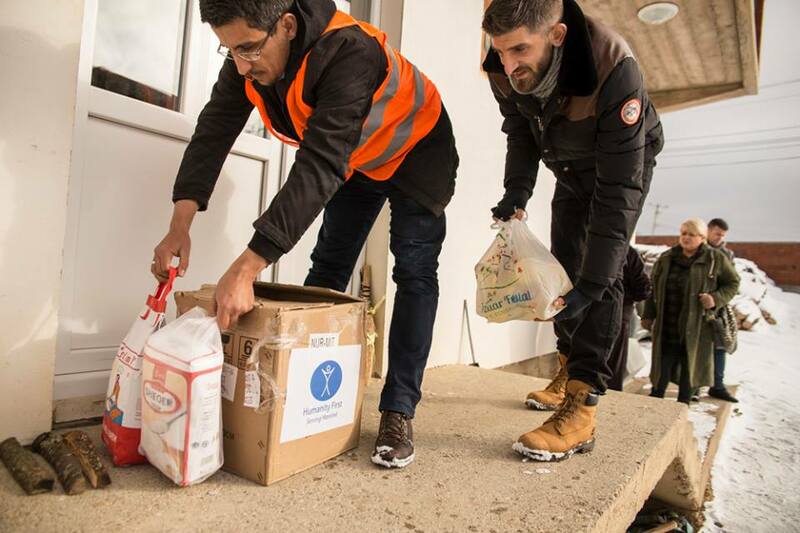 On 19 and 20 December, the humanitarian aid action from the Ahmadiyya and international foundation “Humanity First” continued in the municipality of Pristina. With the motto Love for all and hatred for none and “Humanity First, serving mankind” both organisations distributed these food supplies to 500 people in severe economic conditions during these two days. Beneficiaries of this assistance were families with social assistance. Through cooperation of Ahmadiyya, Humanity First and the Municipality of Prishtina, respectively the Director of Social Welfare, Mrs. Valbona Osmani – Mehmetaj, enabled the aid to be distributed in several locations of Prishtina such as: “Kodra e Trimave”, “Qafë”, “Bregu i Diellit” and “Hajvali”. Social Director Muncipality Pristina Mrs Osmani herself in fore front to deliver the food packets to needy familes. On 19 December 2018, aid was distributed to the “Kodra e Trimave” district for 60 families, some of this families came to take the food packets in the social work center and about the remaining the food packets were brought to their homes because of their hardship to come on the social center. This disctrict is known as the poorest region of Prishtina with 979 severe registered cases. It was told by the director there exist several of such cases but people do not dare to register because of their pride. Their faces were full of joy and happiness especially children were receiving the volunteers with cheerfulness. Ahmadiyya and HF Kosovo volunteers delivering Packets to needy families at door steps. The package included these food products: a pack of oil, flour, sugar, salt, pasta, rice, soup, marmalade etc. One packet has the price of 40.00 Euro. What is also important to mention the food products were chosen to be all local, which means that from this help for the families of social assistance project has supported the economics of Kosovo. The representative of Ahmadiyya and Humanity First in Kosovo thanked the willingness of the cooperation of the Municipality of Prishtina and the volunteers who helped in these cold and snowy days, and promised that the assistance will continue and will extend to all Kosovo municipalities in the months to come. Very good help for the people of Kosovo by Humanity First. InshAllah Humaity First will always be able to help those in needs and may Allah reward their efforts! MashAllah Amazing effort! It is great that Allah has given us the opportunity to help others. May Allah reward everyone. Great deed by great people! Humanit First is setting examples. It’s so nice to see people doing all these great works to help others. InsahAllah in the near future we can see work like this be done more. It is truly remarkable to see this type of work being carried out. Hopefully, everyone gains inspiration from such deeds, and tries to instill them in their own daily lives. Humanity First is always setting great examples!